For pricing and more information on this title, call us at 1-877-394-8826. Discounts may be available to customers that subscribe to both online research and print products. 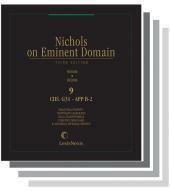 The only combined treatise and practice guide encompassing all topics in the field of eminent domain for all jurisdictions. • The passing of ownership and the nature of the title acquired. 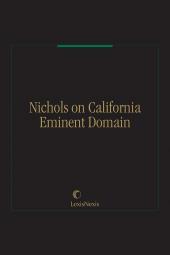 Nichols on Eminent Domain® is regularly cited by state and federal courts as well as by the United States Supreme Court in its eminent domain and condemnation cases, including the Supreme Court's decisions in Del Monte Dunes and Palazzolo. Guides You on Aspects of Valuation. You'll get the arguments that can be raised to increase or decrease the value of your client's property, including market values, damages, proposed use, amount of award, income, improvements, sales, and offers. You'll also get the rules of evidence pertaining to valuation. Speeds You to the Cases and Facts. A comprehensive index is included. Decisions are footnoted and arranged jurisdictionally for fast and easy access to cases and topics. The only combined treatise and practice guide encompassing all topics in the field of eminent domain for all jurisdictions, Nichols on Eminent Domain® is the most comprehensive work available. • Definitive treatment of eminent domain and valuation. • In-depth analysis of condemnation practice and procedure, including discovery, evidence, jury instructions, and examination of experts. • Recent important judicial developments and emerging areas of the law, including landmark Supreme Court decisions on public use and public purpose, exactions, compensation for loss of business goodwill, inverse condemnation, uniform professional appraisal standards, and the taking of environmentally contaminated property. • Four revisions yearly, with case supplements and special alerts as needed to ensure up-to-date coverage. • Footnotes contain extensive annotations arranged alphabetically by state. • Each chapter begins with a synopsis directing you to the specific section you need to review. Download a Special Alert on the U.S. Supreme Court decision in Kelo v. City of New London. This 18-volume loose-leaf treatise is updated four times per year and is also available as an eBook in .mobi and .epub formats, as well as on lexis.com.